Shikha Singhal took a six-year break to spend quality time with her twin daughters. While contemplating a career return for several years, she kept herself busy volunteering at their school and coaching their robotics team. When her daughters started high school, she decided it was finally time to return to work. After completing several courses and finding a new passion within the software engineering field, she was accepted into a returnship at Intuit, where she was then hired full-time as a Software Engineer. What type of work did you do before taking a break, and how long were you out of the workforce? I worked for six years as a Senior Software Engineer, doing back-end work using Java, Service Oriented Architecture and SQL. Then I was out of the workforce for about six years. What prompted you to take a break? My twin girls were in 4th grade, and I felt that they were growing up too fast, and wanted to spend some quality time with them. I decided to take a break and find time to volunteer in their classroom. I became an art docent in their elementary school, teaching fine art techniques and art history using hands-on projects. I also started and coached a robotics team for my girls to compete in FIRST [For Inspiration and Recognition of Science and Technology] Lego League. While coaching their team and helping it reach the World Festival in Houston, I learned a lot about myself, gained life skills, and got to spend quality time with my kids, which was very valuable to me. As my girls started high school, they got busy with their schedules. Also, I had completed training in the next upcoming technology area, Big Data, and I strongly felt that this field could really help make an impact in people’s lives. I wanted to be a role model for my girls and knew that I had skills to contribute to the workplace. How long were you actively looking for work prior to applying for a returnship? It’s hard to say, because my search was very on-and-off. I’d start looking and apply to a few places, then stop for a bit, especially when my daughter’s robotics competitions were coming up. I was not looking very aggressively. Did you take any classes or complete any training in preparation to return to work? I took an Introduction to Big Data course at UC Berkeley’s Extension School, where I learned about the power of Big Data and all the problems it can help solve. I enjoyed learning something new and was really excited about this field. I got selected for two Big Data Engineering fellowships, where I learned all the different concepts in the field. Taking courses and doing these fellowships gave me my confidence back, by giving me a chance to create a data product of my own. I ended up becoming very interested in the topic, and am now a software engineer who has switched over to working with Big Data. I’m a Software Engineer for Intuit’s data platform team, where we build tools and frameworks for their data infrastructure. Currently, I am working on the QuickData Super Glue Portal, which is a self-serve debugging and monitoring tool to ensure data accuracy, data availability and discoverability for data pipelines. Are there any skills from your previous experience that you use in your new position? The project I’m working on involves a lot of my previous skills. I’m currently working on writing back-end services, which is similar to what I did in my previous job. The most challenging part is making sure you are able to keep a balance between work and life. This is very important to me, and thankfully Intuit allows flexibility for its employees – it’s acceptable to work from home, or leave early, if ever needed. Because of this, I’m able to integrate my work and family time well. Just the feeling of being back to work! When you’re on a break, it’s hard to get over that initial inertia to return, and having to come back out of your shell. This is especially true in technology, because things change so fast. I was very excited to join my team, and felt like I had never left work. I was assigned a critical project right away, and it felt good to contribute and bring my newly learned skills to the team. I was excited to work on a high-priority project immediately after I started. I was the only one working on this particular piece, and it was challenging due to there being many unknowns. I had the chance to collaborate and communicate with many people and successfully deliver it on time. 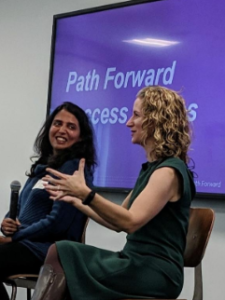 What did you find most helpful about Path Forward’s support of the Intuit Again program? The most helpful were the workshops conducted by Path Forward. Not only did it give us a mentor in Tami, but we were able to connect with different people and network, which was a big highlight. We got to meet other returnees from other companies, and learn from each other’s experiences. Do you keep in contact with any of your fellow returnees, either at Intuit or from your Path Forward cohort in general? I am definitely in touch with other returnees. We built great relationships, and I now have a good network of other returnees. It feels good to have people around who care about you and your situation. You came to speak to our Fall 2018 returnees at a workshop last year. What inspired you to return as a Path Forward alumni and share your experience? I figured I could make a difference in people’s lives by sharing my own experience, as well as the challenges I faced and how I overcame them. I was in their situation once, and I wanted to inspire people. One person told me afterwards that I was their role model for returning to work, and I was so touched. It was very much an “aha” moment for me. If you are able to make a difference in even one person’s life, it feels very rewarding. Do you have any advice for future returnees? Don’t give up. Keep trying. Even if you don’t get hired full-time at the company where you did your returnship, it’s okay. You are not losing anything – you are still gaining the experience and can always use it for your next job. Just apply and use your experience with your returnship as a stepping stone. ← How Do We #BalanceforBetter? Ask These Three Questions.